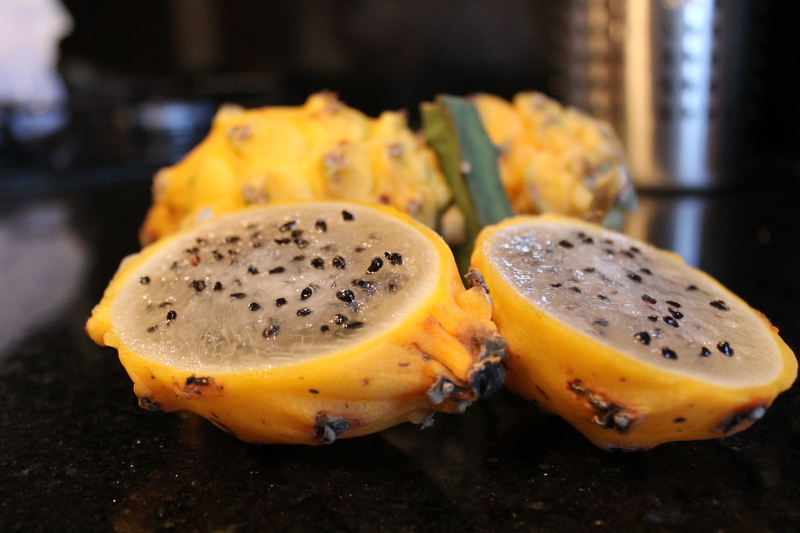 The pitaya or yellow dragon fruit. My goal of trying 100 new fruits in Colombia has lead to some funny experiences. The pitaya is extremely good for you, by most accounts. Some think it should be sold as a diet fruit. If I were to market it in the U.S., I would call it the “Golden Dragon Fruit” because that’s essentially what it (it’s called the “yellow dragon fruit” which has a much less regal tone). The pitaya is a cactus fruit which when opened up looks and tastes like the better known pink skinned dragon fruit (I have yet to see a pink dragon fruit here in Colombia — just like I have yet to see a lemon). I was looking up about the pitaya on Wikipedia and learned not only how healthy it is (same amount of potassium as a banana) but also about the other names for the pitaya. Of the various names, I liked “Queen of the Night” quite a bit. The pitaya is a native of the Americas — and did you see that pink fleshed one? I can’t wait to try that one. The easiest way to eat the pitaya is to slice it in two, take a spoon, scoop it out, and eat. Delicious. It’s a mild sweet juicy flavor. The seeds in the white flesh can be eaten as well. The yellow skin cannot be eat (as far as I know). Some people put this in juice or a smoothie but I think it’s easiest eaten out of the half-skin. The pitaya are pricey as far as fruit goes, as I bought a whole bunch at Paloquemao and as they cost 4,000 pesos per pound — that makes it about 85 cents per fruit. Very few fruits make me giggle. But the pitaya does, solely because of its digestive effects. It is like the Vitamix or blender of the fruit world. After having eaten these for several days in a row, I discovered that each time I ate one, I got a funny feeling in the pit of my tummy. Gurgling. A rumble in the jungle. It was comical… Unlike most fruits, the pitaya requires some forethought: know where you will be 110 minutes after consumption!